It has been very impressive to see the very high number of opponents to the parking tax of £1 a day imposed by Westminster City Council on motorcyclists, but at the same time, it’s also been amazing to see a small number of bikers who don’t mind throwing their money away with no benefit in return. In fact, it appears that most of these bikers keep moaning about the parking tax but are not prepared to stand up for their rights and we wonder why. Every citizen of and resident in the United Kingdom has a right to protest and express their feelings and opinions, so why not take the opportunity to do so? It’s only £1 a day, so what are you complaining about? This is by far the most frequent question that is being asked to protestors. Well, the No To Bike Parking Tax group is campaigning against the principle of charging for motorcycle parking, not the amount charged. Whether the charge is £1, £10, 50 pence or even 10 pence a day, it’s the principle of charging for bike parking that is being challenged, not the fare itself (although if it was ridisculously high, it would also be challenged). To park your bike in central London, you currently have to pay £1 a day, otherwise you get a ticket for minimum £60 payable within 14 days. In August 2008, Westminster City Council introduced a charge on motorcycle parking payable by mobile phone and debit/credit card. Motorcyclists are required to shout their credit/debit card details over the phone in the middle of the street or send them over by text message. At a time when financial institutions have taken draconian measures to combat fraud, it is believed that this payment system is totally inappropriate and prone to identity theft. The vast majority of the motorcycle parking bays in Westminster have remained in exactly the same conditions as when their use was free of charge, so what are motorcyclists paying £1 a day for? 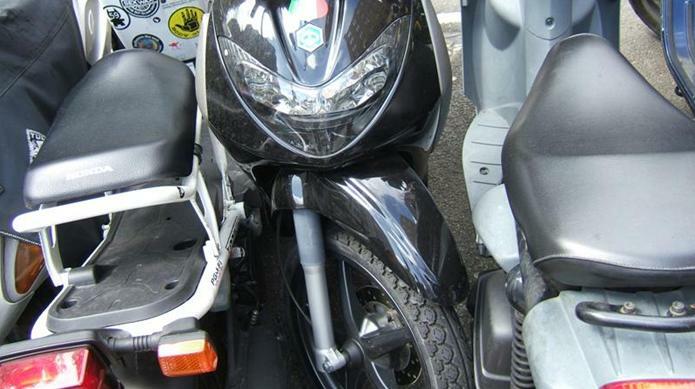 Not only have the bays remained in exactly the same conditions as prior to charging, but they have become even more over-crowded, with bikers having to squeeze their bikes in minuscule spaces with a high risk of damaging them. So what do the bikers get in exchange for their £1 that they didn’t use to get when parking was free? Nothing is the answer: same security (i.e. none), same bays, same roads, same spaces, same ground paint. They get nothing new that justifies a charge, and for this reason, this charge is a pure stealth tax for which the aim is to bring revenue to the council at no cost. Last year, Westminster Council scrapped all parking meters to make pay-by-phone the only on-street parking payment method. They spent a considerable amount of taxpayers’ money to implement what used to be the Verrus pay-by-phone technology (now PayPoint). A part from the fact that this method discriminates against those without a mobile phone and debit/credit card, adding motorbikes and scooters into the scheme didn’t cost anything extra since the technology had already been implemented for cars. So charging powered two wheelers (PTWs) for parking without providing additional facilities and without incurring additional costs to implement the scheme is pure robbery and rip-off. But after all, it’s only £1 a day will say the council. So what don’t they scrap it if it’s ONLY £1 a day? It’s such a small charge that they won’t miss it, will they? The truth is that it brings millions of pounds of revenue per annum to the council, so charging for motorcycle parking is a pure money-grabbing exercise. It’s got nothing to do with kerb space management, traffic management or anything like that. It’s purely a nice and easy way for Westminster Council to make money to recover their recent £22 million budget overspend and fund their annual civic dinner in one of the most expensive and prestegious venues in London, while discouraging the use of a greener and non-congestant mode of transport. If not scrapped, how long will it take Westminster to increase the charge to say £10 a day? 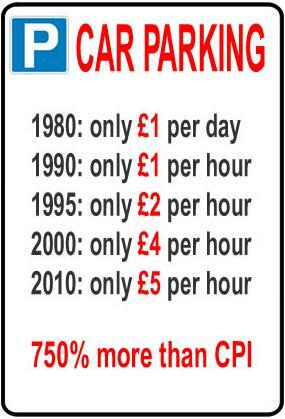 Look at how car parking fares have increased over the years and think about how the same could apply to bikes. So yes, it’s only £1 a day now but tomorrow, will you still say it’s only £10 a day? If we tolerate £1 a day now we’ll have to pay £5 a day or more pretty soon. We cannot let this happen. Moaning about the tax is not enough. Every bike and scooterer in London should join the protests or be prepared to pay the consequences of their inactions later.